I hope everyone had a great weekend. As for me, I’ve been adding a few patriotic touches to our front porch in preparation for July 4th. I haven’t finished yet, but I’ll show you what I’ve done so far. If you follow on Facebook or Instagram, you may have seen this sign that I found at the auction on Memorial Day. The sign is made from a thick, heavy piece of wood so instead of hanging it, I decided to just display it on the table. 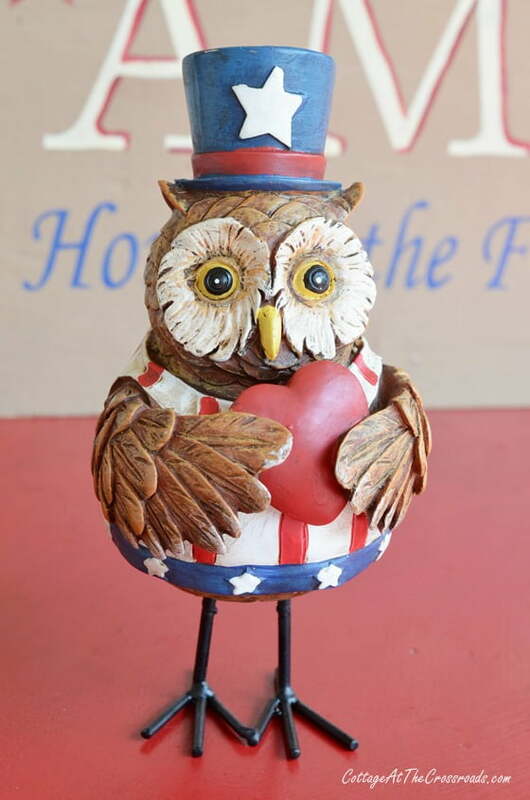 And when I spotted this adorable owl at Hobby Lobby recently, he just had to come reside on our porch! The cushions have been recovered in a summery, outdoor fabric with red ticking cording. I had them recovered instead of buying new ones because they are the exact, right size for these chairs. I pulled out some of the decorations I made last year. 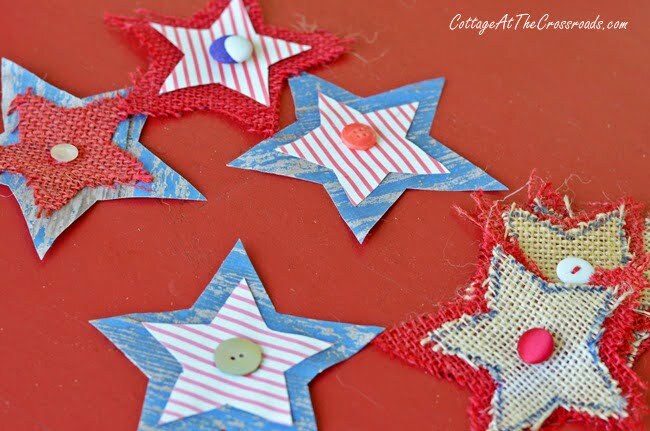 These stars were used on the garland around the front door. But this year…. 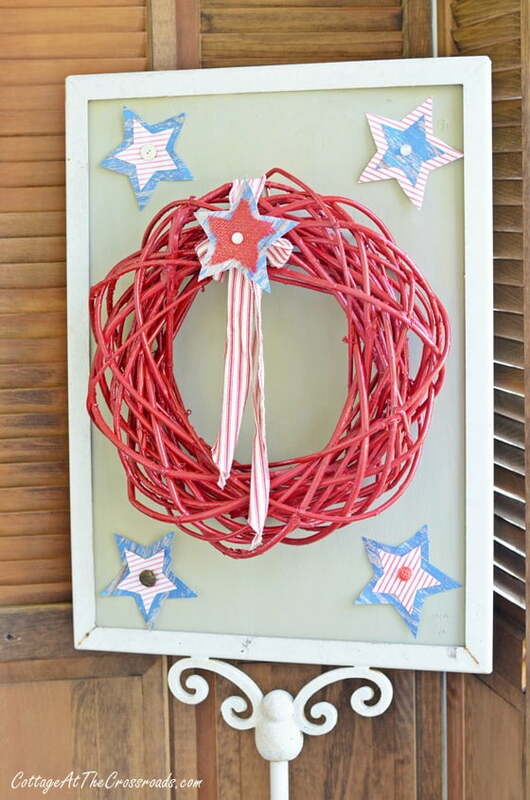 I added some of them to the wreath on the metal stand that I showed you on our Summertime Porch. And some of the stars ended up on this pillow. They are just safety-pinned to the pillow! 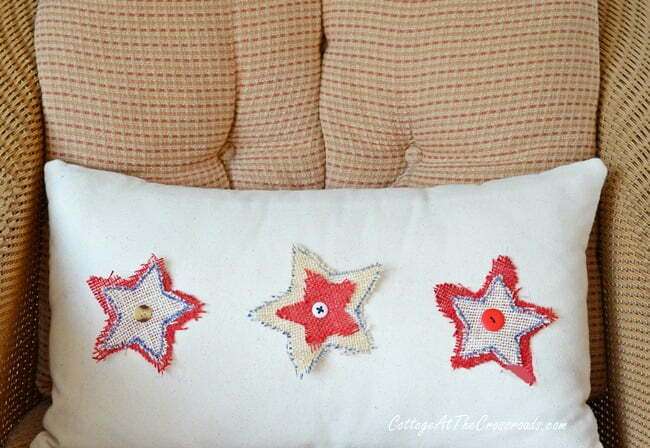 A quick way to add some seasonal decor to a plain pillow. 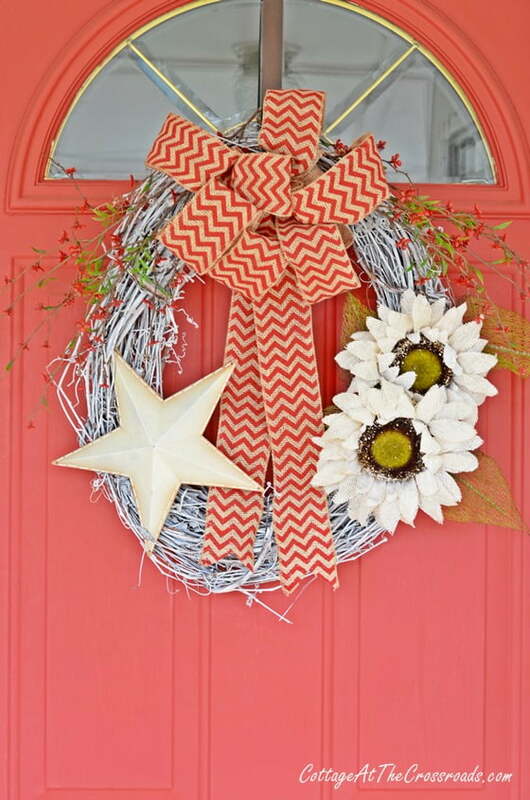 The summer wreath on the door got a metal star. 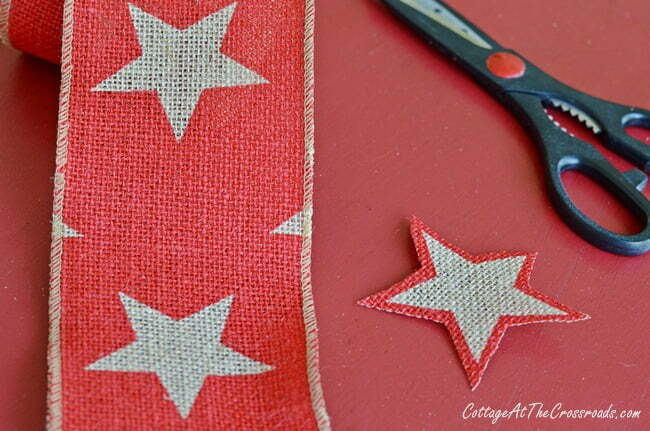 For the Fourth of July, the garland needed to be star-studded, so I added some. They were cut from this ribbon that I already had. Here you can see how it all looks together. 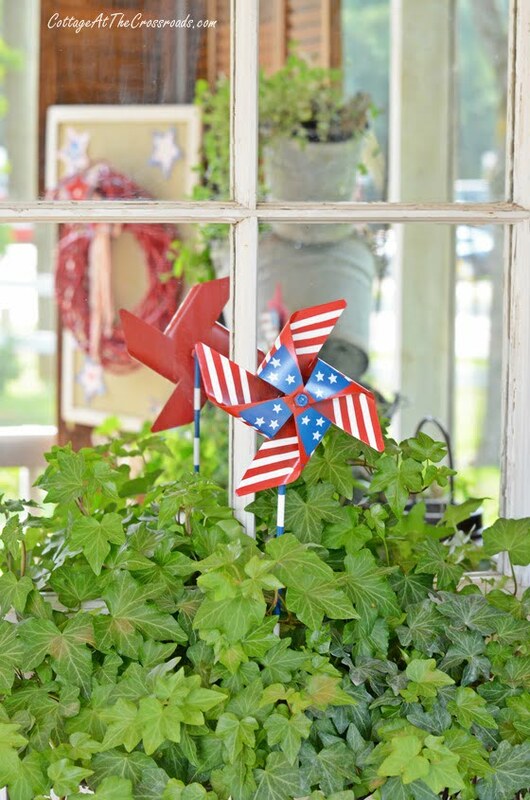 A patriotic pinwheel jazzes up the ivy. And a new little pick went into the topsy turvy buckets. You’re probably thinking this is a new throw on the back of our rocking chair, right? Well, I actually had a twin-sized quilt in my buggy at Ollie’s, but I spied the matching king-sized pillow sham. (It was just $5.99 and plenty big to hang over the back of the rocker!) 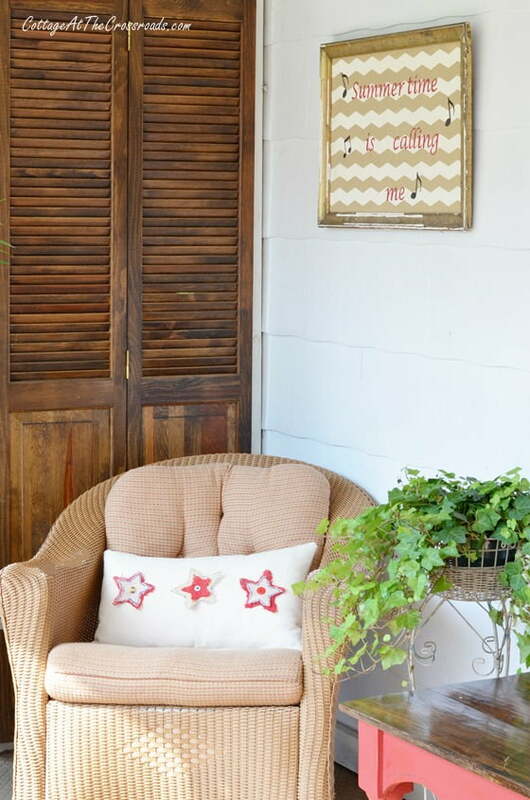 A big SCORE for adding some red, white, and blue to our country porch! 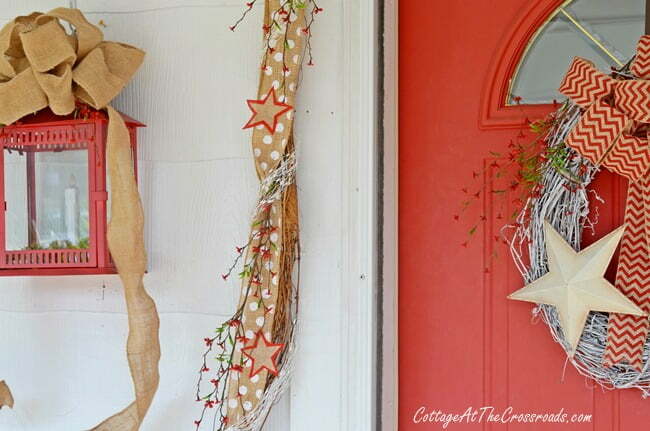 I have a few more projects for adding a little more patriotic decor to the porch and I promise I’ll show it all soon! Jane your porch is SO beautiful!! Pinned! The summer wreath on the door looks great. I was wandering are the flowers live or artificial? And I like that the star is metal. It is all super cute, Jane. What a great way to use that sham. I love that. 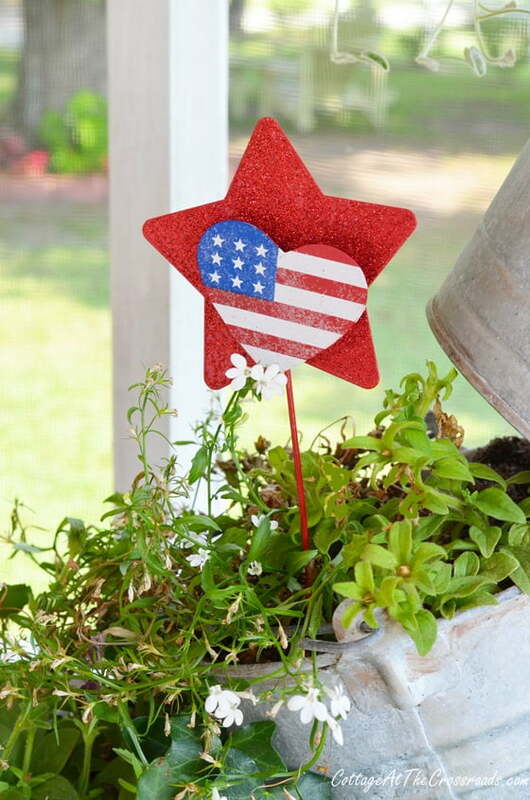 Love all the patriotic touches you added to the porch! The quilt is awesome! 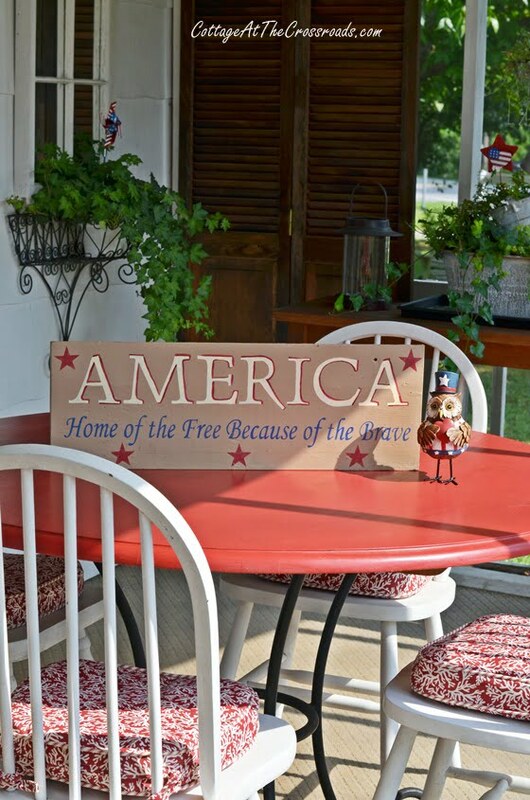 You have me all wound up to get out and get the rest of my patriotic decor for the porch set up. I did work on the porch a little last night, but it needs a bit more of the red, white, and blue to make it ready for the Fourth of July. 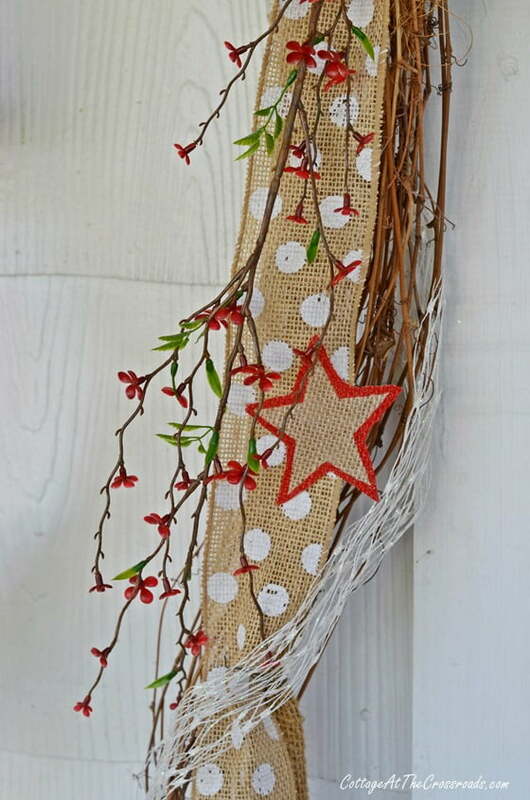 I love of your star idea for the garland. I have a big hunk of red burlap just waiting for me to use it on a project. 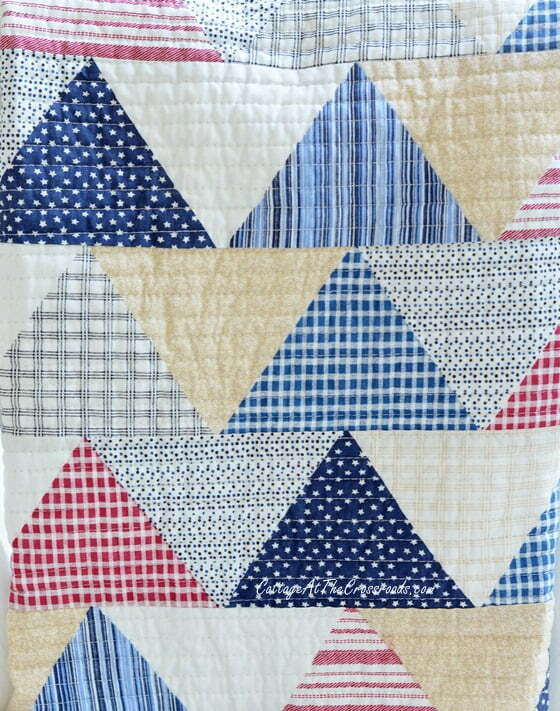 I think I am seeing red stars with white and blue gingham checks appliqued in the middle or maybe just glued. I simply adore red white and blue together, so this time of year, I’m loving all the patriotic decor. Your wreath and ribbons are so pretty and classic looking! Jane, would you be willing to share the color/brand of paint on your front door? Love it! Hi Regina, I’m sorry but I can’t help you with the front door color. I painted it over 2 years ago, and more than likely, I mixed several colors to get the one I wanted. (I’m always doing that!) All I can tell you is that it is a red that leans more toward coral rather than a blue-red. Hope that helps! Looking good, I don’t know how you do everything you do. 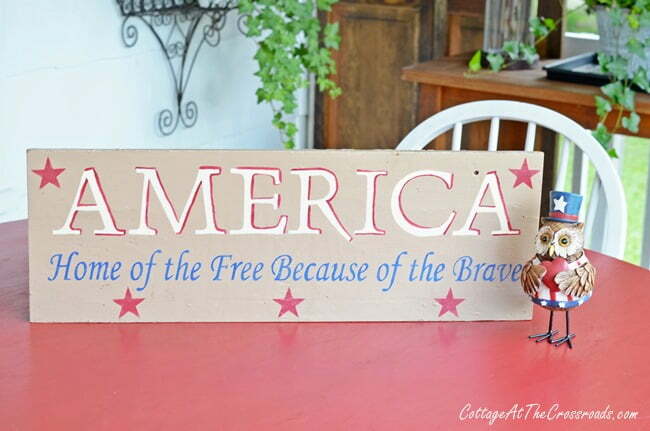 Great patriotic touches Jane, Love that sign and the saying is so true and perfect!!! 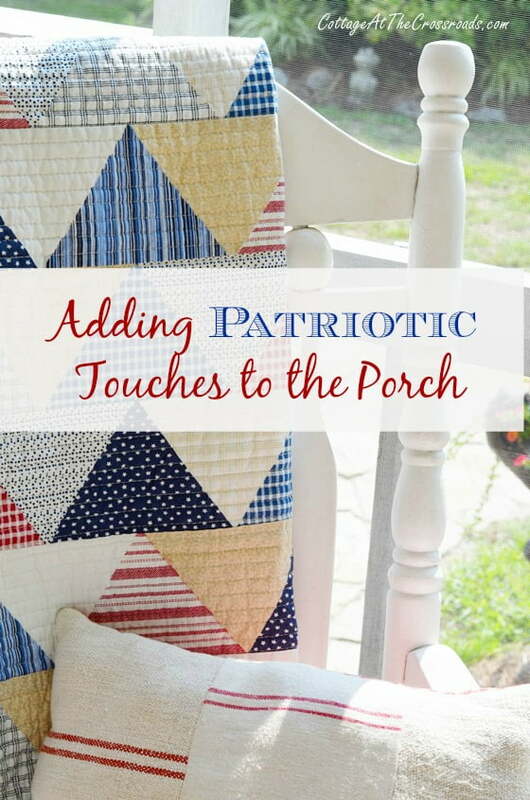 A wonderful “flag waving, hooray for the red, white and blue” porch…I love the quilt too….you are giving me some great inspiration of creating my 4th of July porch Jane….love it!! Jane I just love it all!! I have got to get to Ollies too! Everybody keeps showing their great finds! Wonderful talented lady. Excellent! Lovelovelove all of it! Very cute porch! I love all of the homey touches, especially the quilt and the use of burlap. Well done! Loving all the patriotic touches, the throw is my favorite. Pinning!